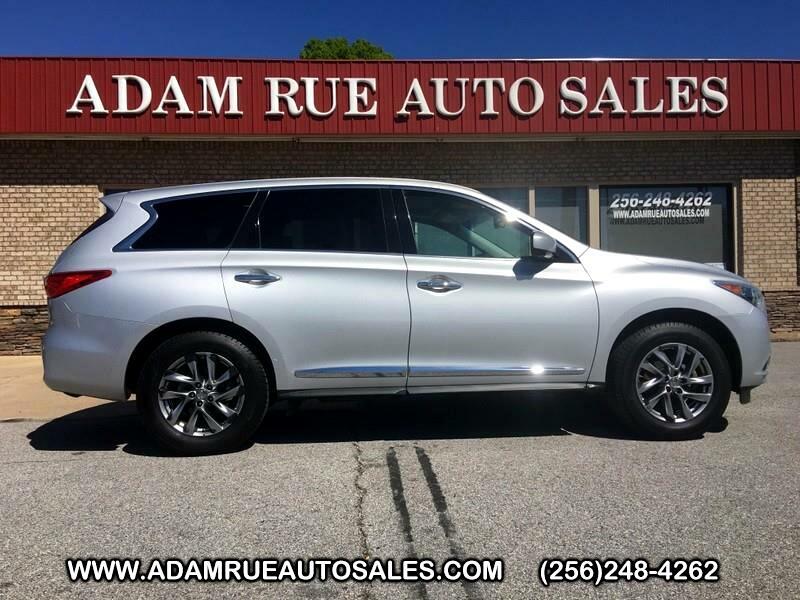 This 2013 INFINITI JX35 is proudly offered by Adam Rue Auto Sales Want more room? Want more style? This INFINITI JX35 is the vehicle for you. You appreciate the finer things in life, the vehicle you drive should not be the exception. Style, performance, sophistication is in a class of its own with this stunning INFINITI JX35. You could keep looking, but why? You've found the perfect vehicle right here. More information about the 2013 INFINITI JX35: The 2013 JX competes with other people movers, but offers more luxury and refinement than many of its competitors. Standard luxury items such as leather seats and a panoramic sunroof immediately distinguish the JX from the run of the mill minivan while equivalently priced SUV's generally offer less space. The JX strikes a nice balance between space, luxury and price, adding a dose of clever design and state of the art technology for good measure. Interesting features of this model are packed full of technology, flexible, room for seven, and Luxurious Thank you for considering Adam Rue Auto Sales! We are proud you are here. Our dealership is focused on making your buying experience as pleasurable as possible. We understand how difficult it can be finding the perfect vehicle. Our staff has been in this business many years and are trained to be professional and courteous while assisting you. After all, you are the reason we are here. We want to be a little different than what you will find down the street. We stock quality vehicles and look forward to treating you like family.